Graft stenosis poses a critical obstacle in tissue engineered airway replacement. To investigate cellular mechanisms underlying stenosis, we utilize a murine model of tissue engineered tracheal replacement with seeded bone marrow mononuclear cells (BM-MNC). Here, we detail our protocol, including scaffold manufacturing, BM-MNC isolation, graft seeding, and implantation. Wiet, M. G., Dharmadhikari, S., White, A., Reynolds, S. D., Johnson, J., Breuer, C. K., Chiang, T. Seeding and Implantation of a Biosynthetic Tissue-engineered Tracheal Graft in a Mouse Model. J. Vis. Exp. (146), e59173, doi:10.3791/59173 (2019). Treatment options for congenital or secondary long segment tracheal defects have historically been limited due to an inability to replace functional tissue. Tissue engineering holds great promise as a potential solution with its ability to integrate cells and signaling molecules into a 3-dimensional scaffold. Recent work with tissue engineered tracheal grafts (TETGs) has seen some success but their translation has been limited by graft stenosis, graft collapse, and delayed epithelialization. In order to investigate the mechanisms driving these issues, we have developed a mouse model for tissue engineered tracheal graft implantation. TETGs were constructed using electrospun polymers polyethylene terephthalate (PET) and polyurethane (PU) in a mixture of PET and PU (20:80 percent weight). Scaffolds were then seeded using bone marrow mononuclear cells isolated from 6-8 week-old C57BL/6 mice by gradient centrifugation. Ten million cells per graft were seeded onto the lumen of the scaffold and allowed to incubate overnight before implantation between the third and seventh tracheal rings. These grafts were able to recapitulate the findings of stenosis and delayed epithelialization as demonstrated by histological analysis and lack of Keratin 5 and Keratin 14 basal epithelial cells on immunofluorescence. This model will serve as a tool for investigating cellular and molecular mechanisms involved in host remodeling. Long-segment tracheal defects can present as rare congenital conditions such as complete tracheal rings and tracheal agenesis, as well as trauma, malignancy, and infection. When exceeding 6 cm in adults or 30% of the tracheal length in children, these defects cannot be treated by surgical reconstruction. Attempts to replace the airway with autologous tissue, cadaveric transplants, and artificial constructs have been plagued by chronic infection, granulation, mechanical failure, and stenosis. Tissue engineered tracheal grafts (TETGs) can potentially address these problems while avoiding the need for life-long immunosuppression. In the last decade, TETGs have been tested in animal models and utilized clinically in rare instances of compassionate use1,2,3. In both clinical and large animal studies, post-operative recovery from tissue engineered airway replacement required numerous interventions to combat stenosis (defined as >50% luminal narrowing) and maintain airway patency. Additional TETG work has sought to reduce this stenosis through evaluating the role of cell seeding choice, vascularization and scaffold design. Cell seeding choices and scaffold design aimed at restoring native trachea structure/function have mainly been focused on respiratory epithelial cells and chondrocytes seeded on various resorbable, non-resorbable and decellularized scaffolds. 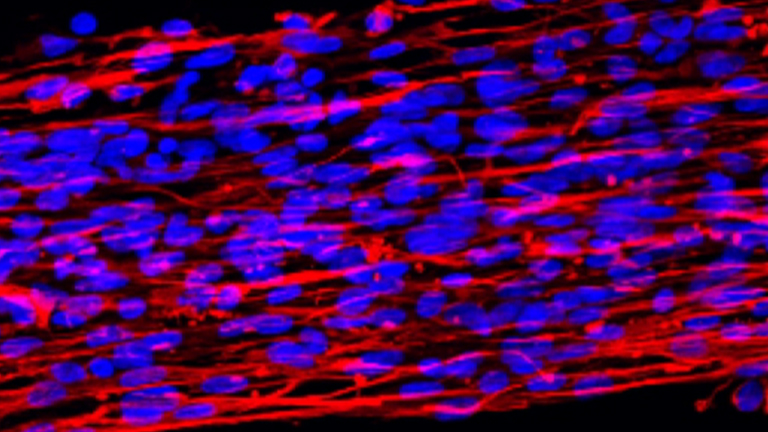 As vascularization likely plays an major role in the development of stenosis, other groups have focused on optimizing in vitro or heterotopic models to expedite revascularization or neoangiogenesis4. Nonetheless, achieving successful vascularization while also maintaining a mechanically competent and functional TETG remains a challenge. Despite recent advances, minimizing stenosis remains a critical obstacle to clinical translation. 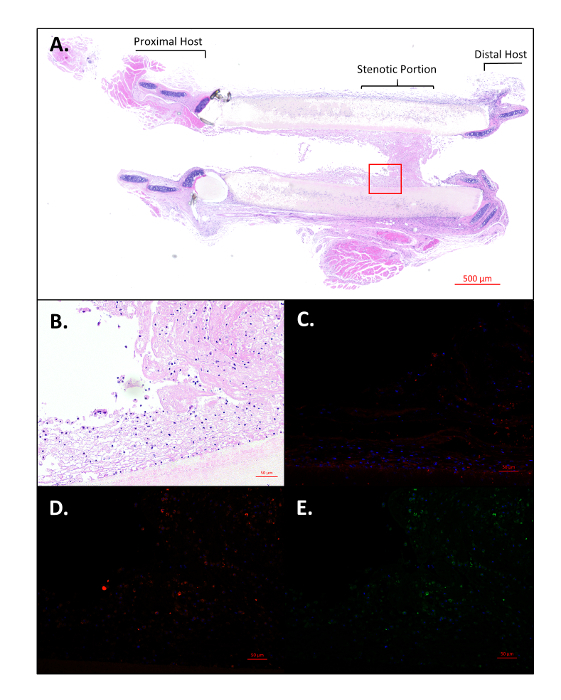 To investigate this histopathological response to TETG implantation in vivo, we developed an ovine model of tissue engineered tracheal replacement. The graft was composed of a mixed polyethylene terephthalate (PET) and polyurethane (PU) electrospun scaffold seeded with bone marrow-derived mononuclear cells (BM-MNCs). In this small cohort, we demonstrated that seeded autologous BM-MNCs accelerated re-epithelialization and delayed stenosis5. Although seeding with autologous BM-MNCs improved survival, the cellular mechanism by which BM-MNCs modulate the formation of functional neotissue remains unclear. Investigation on the cellular level required development of a murine model of tissue engineered tracheal replacement. Similar to the ovine study, we utilized a PET:PU electrospun scaffold seeded with BM-MNCs. Consistent with the ovine model, TETG stenosis developed over the course of the first two weeks following implantation1,2,3,5. This suggested that the murine model recapitulated the pathology observed previously, enabling us to further interrogate the cellular mechanisms underlying airway stenosis. In this report, we detail our protocol for tissue engineered tracheal replacement in the mouse model including scaffold manufacturing, BM-MNC isolation, graft seeding, and implantation (Figure 1, Figure 2). All methods described here have been approved by the Institutional Animal Care and Use Committee (IACUC) at Nationwide Children's Hospital. Prepare a polymer nanofiber precursor solution by: 1) dissolving 8 wt% PET in 1,1,1,3,3,3-hexafluoroisopropanol and heating the solution to 60 °C and by 2) dissolving 3 wt% PU in 1,1,1,3,3,3-hexafluoroisopropanol at room temperature. Once cooled, combine the solutions to create a final polymer mixture of PET and PU (20:80). Electrospin the PET+ PU solution onto a stainless steel rod (1 mm diameter) utilizing a 20G blunt tip needle on a 60 mL syringe filled with the PET:PU solution using a high-voltage DC power supply set to +14 kV on the needle, another high-voltage DC power supply set to -3 kV, a 5 mL/h flow rate, and a 20 cm tip-to-substrate distance. Rotate the rod at 350 rpm during fiber deposition. Continue electrospinning until the desired scaffold wall thickness of 300 µm is achieved. Slide the scaffold off the rod, then hold it under vacuum overnight to remove any residual solvent. Sterilize the scaffold using an ultraviolet light dosage of 350 mJ/cm2 prior to implantation. Euthanize a 6-8 weeks old, female, C57BL/6 mouse with a cocktail of ketamine (200 mg/kg), xylazine (20 mg/kg) and ketoprofen (10 mg/kg). Check for complete euthanasia by tail-pinch method. Be sure to follow local guidelines for euthanasia. Under sterile conditions, remove the skin over the femurs and tibias to expose bone using fine scissors and micro-Adson forceps. Use Dumont #5 forceps and Dumont #5/45 forceps to remove the fascia and the tendons. Separate the bones and cut each of them on both the ends. Using a 5 mL syringe and a 25G needle, flush the bone marrow in a Petri dish containing 30 mL of Rosewell Park Memorial Institute (RPMI) media. Filter this RPMI with bone marrow through a 70 µm nylon cell strainer into a 50 mL tube. In a Biosafety Cabinet, place 5 mL of polysurcrose and sodium diatrizoate in a 15 mL tube. Gently add the RPMI containing bone marrow mononuclear cells down the side of the tube to avoid mixing of the two layers. Centrifuge at 461 x g for 30 min with "Brake 1" at 24 °C. NOTE: On our centrifuge, brake 1 stands for the longest run out time during deceleration. Out of the three layers formed, discard the top (pink) layer of plasma and collect the middle (clear) layer consisting of the bone marrow mononuclear cells. Discard the precipitate of red blood cells. Dilute the bone marrow mononuclear cells (BM-MNC) in phosphate buffered saline (PBS) in a 1:1 ratio and centrifuge at 461 x g for 10 min with "Brake 9" at 24 °C. Remove the supernatant and dilute the pellet with 5 mL of PBS. Centrifuge at 461 x g for 10 min with "Brake 9" at 24 °C. Remove the supernatant and dilute the pellet with ~10 mL of RPMI. Dilute 10 µL of the BM-MNC solution with an equal volume of 0.4% trypan blue in a 1 mL tube. Place 10 µL of the solution in a cell counting chamber slide. Count the cells using an automated cell counter. Repeat the step and calculate the average number of cells. NOTE: An average cell count of 1 X 108 cells was obtained from the use of two donor mice. This would be equivalent to two femurs, and two tibias that bone marrow is isolated from. Centrifuge the BM-MNC solution at 461 x g for 10 min with "Brake 9" at 24 °C. Remove the supernatant and dilute the cell concentration to 107 cells/graft. NOTE: We have studied seeding efficiency between 1, 10 and 100 million cells and found that 10 million cells per graft yields the highest seeding efficiency. Measure the lengths of the scaffolds and if needed, cut them to a length of 5 mm. Pre-wet the scaffold with 5 µL of RPMI for 5 min. Remove the RPMI. Add 5 µL of the BM-MNC solution to the lumen of the scaffold for 10 min. Pass a 21G needle through the lumen of the graft and incubate the graft in 1000 µL of RPMI overnight at 37 °C in an incubator. NOTE: Care should be taken to maintain aseptic technique during the graft implantation procedure. Use 6-8-week-old female C57BL/6 mice as recipients for the cell seeded grafts. Inject enrofloxacin (10mg/kg) subcutaneously 24 h before surgery and just before incision. Weigh the mouse and administer a 0.1 mL/10 g dose of the anesthetic cocktail of ketamine (100 mg/kg), xylazine (10 mg/kg) and ketoprofen (5 mg/kg) as analgesia intraperitoneally. Check if the plane of anesthesia has been achieved by tail-pinch method. On confirming the level of sedation, apply a sterile ophthalmic ointment to the eyes and clip the hair on the surgical site from chin to clavicles. Place the animal on a pad in a dorsal recumbent position. Disinfect the surgical site using first a povidone-iodine prep pad, followed by an alcohol prep pad (70% alcohol), and once more a povidone-iodine prep pad. Place the animal under the dissecting microscope with its head away from the surgeon. Make a midline incision ranging from the clavicles to the hyoid bone with the help of fine scissors and micro-Adson forceps. Clean the fascia with Dumont #5 and Dumont #7 fine forceps, along with a sterile cotton swab if needed, and insert a self-retaining Colibri retractor. Open the strap muscles (Figure 3A) with Dumont #5 and Dumont #7 fine forceps to expose the thyroid cartilage, cricoid cartilage and the trachea. Bluntly separate the trachea from the recurrent laryngeal nerves running parallel on either side, followed by circumferential separation of the trachea from the esophagus (Figure 3B). Using a 20G needle and surgical marker, stain the anterior portion of the trachea. Identify the trachea and make an incision below the third tracheal cartilage ring and transect the trachea using a pair of Vannas-Tubingen spring scissors and a pair of Dumont #7 fine forceps. Holding it with the fine curved forceps, secure the distal trachea to the sternum using sterile 9-0 nylon suture to create a temporary tracheostomy (Figure 3C). NOTE: An alternative suture material that can be used is the 9-0 PDS for tracheal implantation and muscle reapproximation. With a 20G needle and a surgical marker, stain the graft to represent the anterior portion. Implant the graft inserting the proximal-posterior, proximal-lateral and proximal-anterior sutures, in that order using 9-0 sterile nylon suture (Figure 3D), Dumont #7 fine forceps and a needle holder. Turn the animal 180° to place its tail away from the surgeon. Release the temporary tracheostomy. The distal trachea is incompletely transected to permit the use of the resected segment as a stump for retraction. When no longer needed, the 5 MM trachea segment is removed completely. Complete the distal anastomosis by placing the sutures in the similar fashion as the proximal anastomosis. Re-approximate the graft position and the strap muscles. Close the incision using 9-0 sterile nylon sutures in a running pattern. Inject 0.1 mL of buprenorphine (0.1 mg/kg) subcutaneously and place the animal in a recovery cage placed on a heating pad without other animals in the cage. Observe the mouse until it is conscious and able to ambulate, then transfer the mouse to a new cage with soft bedding, moist chow and medicated water (ibuprofen, 30 mg/kg) for 48 h. After this time period, return the mouse to a normal cage with other mice. NOTE: Mice that maintain respiratory distress or decreased activity after implantation are observed by laboratory and/or animal staff in a 32 °C incubator. If this continues for more than 48 h, then the mice should be euthanized. NOTE: Hematoxylin and eosin stains were performed using standard technique by Nationwide Children's Hospital Morphology Core. Immunohistochemistry was performed according to the below steps. Deparaffinize the slides using 1) xylene for 5 min, 2) xylene for 5 min, 3) 100% ethanol for 5 min, 4) 90% ethanol for 5 min, 5) 70% ethanol for 5 min, 6) distilled H2O (dH2O) for 5 min. Submerge the slides in citrate buffer and place in water-filled pressure cooker. Heat for 10 min then allow to cool to room temperature. Wash with 0.1% bovine serum albumin in PBS (BSA-PBS) for 5 min. Rinse with dH2O. NOTE: Heating can also be done with a hot water bath or microwave for 15 min. Incubate the slides with 3% normal goat serum in PBS for 1 h at room temperature. Wash with 0.1% BSA-PBS for 5 min. Incubate in primary antibody with concentrations for keratin 5 (1:1000)6, keratin 14 (1:250)6 and F4/80 (1:100)7 for 18 h overnight at 4 °C. Wash with 0.1% BSA-PBS twice for 10 min each wash. Incubate with appropriate secondary antibody at concentration of 1:500 for K5/K14 and 1:300 F4/80 for 1 h at room temperature. Wash with 0.1% BSA-PBS twice for 10 min each wash.
Mount using 4', 6-diamidino-2-phenolindole (DAPI) containing mounting media and glass cover slips. Allow to sit for 30 min before imaging. Figure 1 illustrates a schematic of TETG seeding and implantation. Bone marrow was harvested from C57BL/6 mice and cultured in vitro. BM-MNCs were isolated by density centrifugation and seeded onto the TETG. Seeded TETGs were implanted into a syngeneic C57BL/6 recipient mouse. Figure 2 is an overview of the PET:PU TETG scaffold manufacturing process. PET:PU solution was electrospun onto a 20G blunt needle in order to achieve a final TETG wall thickness of 300 µm and lumen diameter of 1 mm to approximate the native mouse trachea. The surface of the TETG can be seen in the scanning electron microscope image with animated mononuclear cells. The surgical implantation procedure is outlined in Figure 3 with the most important steps shown. Figure 3 shows the separation and retraction of strap muscles (Figure 3A) and subsequent circumferential isolation of the trachea from surrounding tissues (Figure 3B). Figure 3C demonstrates the distal temporary tracheostomy with attachment to the sternal notch to ensure patent airway during the procedure. Finally, Figure 3D shows the graft in place after final anastomoses. In a small cohort study, four mice were implanted with TETGs and followed over a two-week period. A few basal epithelial cells can be appreciated in basal cell keratin 5 and 14 staining shown in Figure 4A-C. The combined image (Figure 4C) shows the presence of basal cells on the luminal surface of the graft at 7 days after implantation. Three out of the four animals showed signs of respiratory distress and stridor, two of which required early termination on post-operative days 1 and 7. Upon explantation and histological analysis, graft stenosis was identified as the main contributing factor to the complications. Figure 5A-E gives a view of the post-operative day 7 animal's stenotic region of the TETG. Of note, telescoping of the graft and native trachea is a common finding due to surgical technique. The low (Figure 5A) and high (Figure 5B) powered photomicrograph of the stenosis demonstrates one of the main complications of TETG implantation. Figure 5C is a representative F4/80 stain revealing the presence of host macrophages in the stenotic region. Figure 5D and Figure 5E again show the basal epithelial cell markers keratin 5 and 14 at the stenotic region of the graft. Figure 1: TETG seeding and implantation schematic. Bone marrow-derived mononuclear cells obtained from a donor mouse were isolated by density centrifugation, seeded onto a scaffold, and implanted into a recipient mouse. Please click here to view a larger version of this figure. 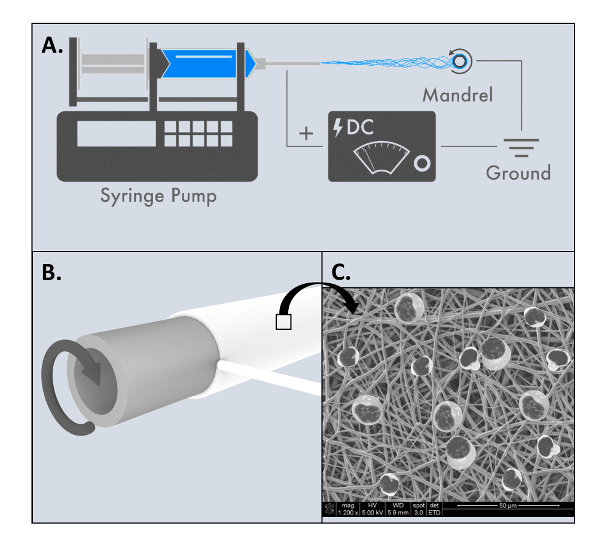 Figure 2: Electrospinning of tissue engineered tracheal graft. (A) Overview of electrospinning process. (B) 20G blunt needle used as rotating mandrel to manufacture mouse scaffolds. (C) Animated SEM schematic of scaffold surface after mononuclear cells have been added. Please click here to view a larger version of this figure. Figure 3: Overview of surgical implantation of scaffold. (A) Separation and retraction of strap muscles. (B) Circumferential separation of the trachea from surrounding tissues/organs. (C) Creation of temporary tracheostomy and attachment to the sternal notch. (D) Implanted graft after proximal and distal anastomoses. Scale bar = 2 mm. Please click here to view a larger version of this figure. Figure 4: Histological evidence of basal epithelial cells. Merged immunofluorescence image of basal cell markers keratin 5 (A) and keratin 14 (B) and the merged keratin 5 and keratin 14 (C). The arrow denotes epithelial tissue growth at the scaffold-native tissue junction. The lumen and scaffold are denoted with (*) and ( ), respectively. Scale bar = 50 µm. Please click here to view a larger version of this figure. Figure 5: Histological visualization of stenotic region of graft. (A) Longitudinally sectioned H&E of length of trachea including graft with distal stenosis near the anastomosis. Scale bar = 500 µm. High power images of selected stenotic region using H&E (B), F4/80 (C), Keratin 5(D), and Keratin 14 (E). Scale bars = 50 µm. Please click here to view a larger version of this figure. Development of a mouse model for tissue engineered tracheas is essential in understanding the factors that have limited clinical translation of the TETGs; namely graft collapse, stenosis and delayed epithelialization4. A few factors that contribute to these limitations include selection of graft material, the manufacturing process, scaffold design and cell seeding protocols. This model allows for faster evaluation of these factors in order to understand the cellular and molecular mechanisms affecting them. We have shown here the presence of epithelial cells (Figure 4) as well as the ability of the model to recapitulate graft stenosis (Figure 5); however, successful use of the model depends on a few key steps during the implantation process. First, during initial incision and isolation of the mouse trachea, it is essential to avoid injury or stretching of the adjacent recurrent laryngeal nerves located in the tracheoesophageal groove. Another important factor during resection of the native trachea is to avoid any damage to the esophagus sitting posterior to the trachea. Endotracheal intubation can be avoided by creating a temporary tracheostomy to allow airflow during the procedure. It is important, however, to keep anything (i.e., tissue) from blocking the temporary distal tracheostomy as well as maintaining the trachea outside of the body cavity to facilitate respiration. Graft telescoping is a common occurrence in graft implantations and may be seen on histological sections. Other animal models that have been utilized in studying TETGs include New Zealand white rabbits, dogs, rats, pigs, and sheep8,9,10,11; many of which can be cost prohibitive and lack comprehensive quantification methods (i.e., ELISAs, Immunohistochemistry antibodies, PCR primers, etc.) and/or transgenic options. Thus, large animal models used are often underpowered or are unable to answer mechanistic questions. The use of transgenic mice in this model as well as the straightforward graft design and manufacturing process make it ideal for faster mechanistic studies looking at graft stenosis and re-epithelialization. The orthotopic transplantation used in this TETG model provides the benefit of the graft being exposed to the external environment and the ability to potentially measure epithelial cell differentiation. However, it is important to remember that translation of transgenic studies to large animal models and clinical trials can be difficult. Furthermore, while this mouse model can potentially be more cost effective in increasing population size, it does not currently have the same clinical diagnostic and therapeutic capabilities as in larger animal models (i.e., bronchoscopy with endoscopic interventions) making it challenging to compare between outcomes. Future work with this model will be focused on investigating optimal cell seeding conditions (cell type, density, etc.) and its role in limiting graft stenosis and improving epithelialization. Scaffold design is also an important variable that has significant effects on graft performance in vivo and will require more investigation as to the optimal scaffold material and microstructure. These studies will assist in the translation of TETGs to large animal models and eventually human clinical trials. We would like to acknowledge Robert Strouse and the Research Information Solutions & Innovations division at Nationwide Children's Hospital for their support in graphic design. This work was supported by a grant from the NIH (NHLBI K08HL138460). Macchiarini, P., et al. Clinical transplantation of a tissue-engineered airway. The Lancet. 372, (9655), 2023-2030 (2008). Jungebluth, P., et al. Tracheobronchial transplantation with a stem-cell-seeded bioartificial nanocomposite: A proof-of-concept study. The Lancet. 378, (9808), 1997-2004 (2011). Elliott, M. J., et al. Stem-cell-based, tissue engineered tracheal replacement in a child: A 2-year follow-up study. The Lancet. 380, (9846), 994-1000 (2012). Chiang, T., Pepper, V., Best, C., Onwuka, E., Breuer, C. K. Clinical Translation of Tissue Engineered Trachea Grafts. Annals of Otology, Rhinology and Laryngology. 125, (11), 873-885 (2016). Clark, E. S., et al. Effect of cell seeding on neotissue formation in a tissue engineered trachea. Journal of Pediatric Surgery. 51, (1), 49-55 (2016). Cole, B. B., Smith, R. W., Jenkins, K. M., Graham, B. B., Reynolds, P. R., Reynolds, S. D. Tracheal basal cells: A facultative progenitor cell pool. American Journal of Pathology. 177, (1), 362-376 (2010). Onwuka, E., et al. The role of myeloid cell-derived PDGF-B in neotissue formation in a tissue-engineered vascular graft. Regenerative Medicine. 12, (3), 249-261 (2017). Grimmer, J. F., et al. Tracheal reconstruction using tissue-engineered cartilage. Archives of Otolaryngology - Head and Neck Surgery. 130, (10), 1191-1196 (2004). Wood, M. W., Murphy, S. V., Feng, X., Wright, S. C. Tracheal reconstruction in a canine model. Otolaryngology - Head and Neck Surgery (United States). 150, (3), 428-433 (2014). Haag, J., et al. Biomechanical and angiogenic properties of tissue-engineered rat trachea using genipin cross-linked decellularized tissue. Biomaterials. 33, (3), 780-789 (2012). Best, C. A., et al. Designing a tissue-engineered tracheal scaffold for preclinical evaluation. International Journal of Pediatric Otorhinolaryngology. 104, 155-160 (2018).